The eBay Product Identifier or EPID identifies a product within eBay catalogs. This is significant for eBay Motors Listings because these products have Parts Compatibility. PSS automatically pulls this in for you so there is no action required on your end. It is pushed up to your eBay listings by PSS. Automatically. PSS only uses the compatibility from EPIDs. You retain the ability to have your title, image, and description that you create in PSS. Parts compatibility is a better way for sellers to list parts that fit a variety of vehicles. It's also a great way for buyers to find parts that fit their vehicles. 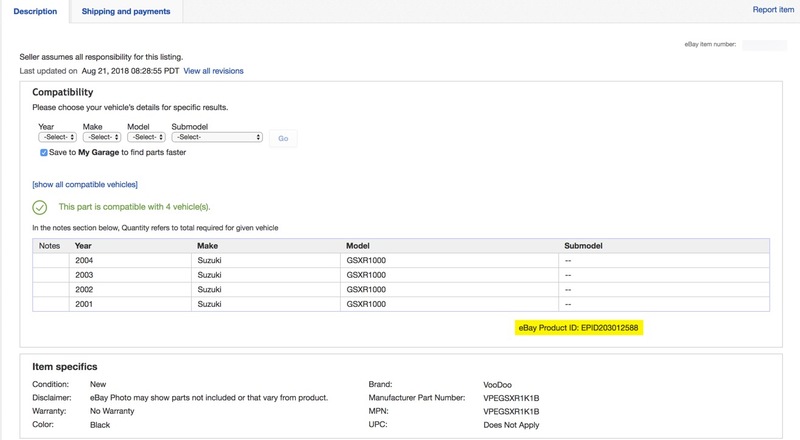 This eliminates the need to list one part multiple times to ensure all compatible vehicles are found in the search. When creating eBay Listings through PSS you will come across these EPIDs primarily on Hard Parts. Here is a screenshot of what you might expect to see on an EPID listing. PSS pulls in EPID updates on a quarterly basis. You can review the most current EPID information by reviewing the eBay US Powersports Parts Catalog. If you ever cross check this page against your listings and find that PSS is not current on EPID information, please notify us at Support@PowersportSupport.com and we will be happy to pull in the most recent updates.